Transverse foramen/ Foramen Transversarium is a gap on each of the transverse processes which contain the vertebral artery and vein and a sympathetic nerve plexus and it is only found in the cervical vertebrae. The spinal nerves and ganglia traverse the dorsal border of the artery along with segmental vessels. 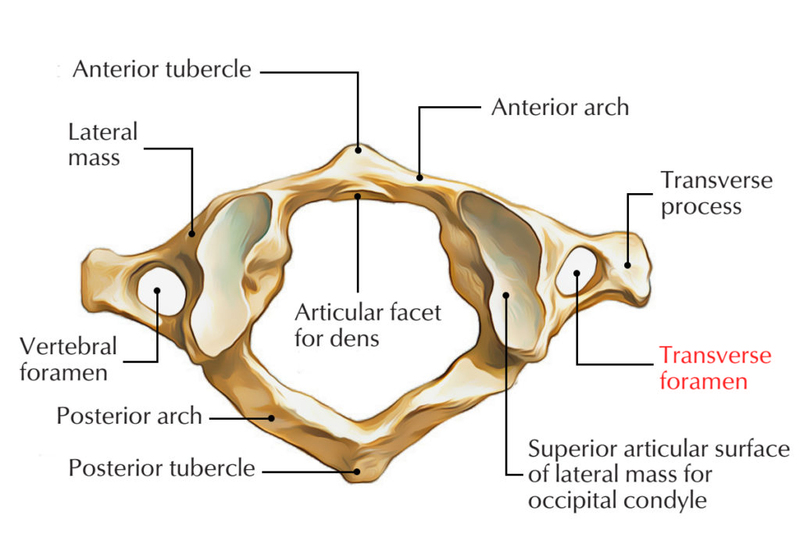 With the exception of the atlas, the anterior and posterior tubercles are located on both sides of the transverse foramen at each transverse process on the cervical vertebrae. The transverse foramen of the seventh cervical vertebra only contains vertebral veins, with no vertebral artery. The vertebral arteries originate via the first portion belonging to the subclavian artery. After the vertebral artery is produced via from the subclavian artery, it travels via the transverse foramina of cervical vertebrae C1 to C6. Transverse process surrounds the transverse foramen on left and right sides. It also serves as a site of muscular attachments. Transverse foramen of C7 vertebra contains only vertebral veins, with no arteries.